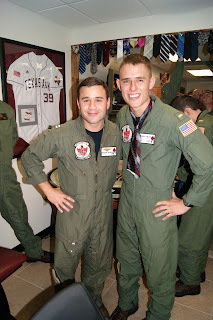 Yesterday I got to attend Parker's tie-cutting, and it was such a neat event to experience! Student aviators have a tradition where, after their first solo, their on-wing (instructor) cuts their tie, symbolizing that the student is able to fly on his/her own. 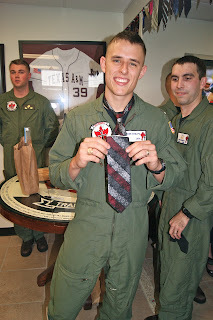 Parker soloed a few weeks ago, but we found out a couple of hours before that his tie-cutting was yesterday. I am blessed to have a boss that is flexible and lets me switch around my lunch break or take time off when I need to, so I was able to go and document. It's tradition for the student to bring their instructor a handle of alcohol, so Parker brought LT Rosario the Kraken Rum he had requested. They have a make-shift plane (two chairs in a vertical row) and the instructor sits in the back seat like he would in the plane. However many students the instructor has at the tie-cutting all share the same seat. LT Rosario had Parker and John Pavalok, so John sat in Parker's lap. They started by each John and Parker telling a funny, embarrassing, or memorable story about their instructor. Parker had a funny story about accidental OCF (out of control flight) that he and his instructor experienced on Parker's first flight. LT Rosario then told something funny about each of his students. For Parker, he started out by saying, "So Phelps is an inquisitive student..." which made me laugh. Anyone who knows Parker in a scholastic environment knows truer words were never spoken. LT Rosario then took out his phone and began reading all the text messages Parker had sent asking questions over the course of time. It was pretty funny. After the instructor tells something about each student, it's tie cutting time! 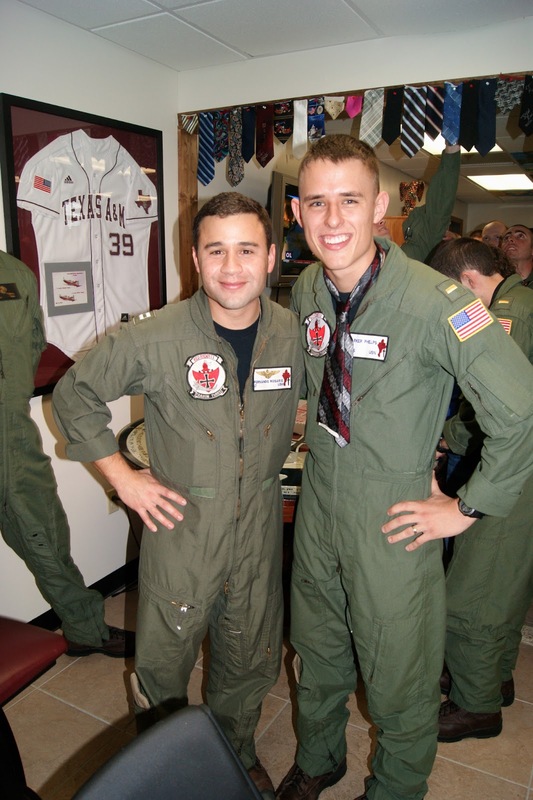 Parker decided to sacrifice his tie from junior year of high school, and now he joins the ranks of the other aviators who have flown a plane solo! It was a blast to hear all the stories from both students and instructors. The aviation community is comprised of some really neat people. 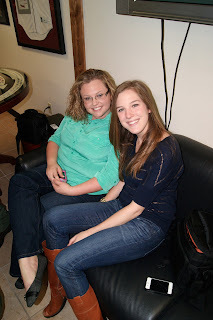 I got to hang with Britni and Sam while we watched the festivities go down, so it was great to catch-up with them! Britni and I! Sorry we missed getting a picture, Sam! Couldn't be prouder of you!